All About Mushroom Coffee + My Mushroom Coffee Mocha Recipe! 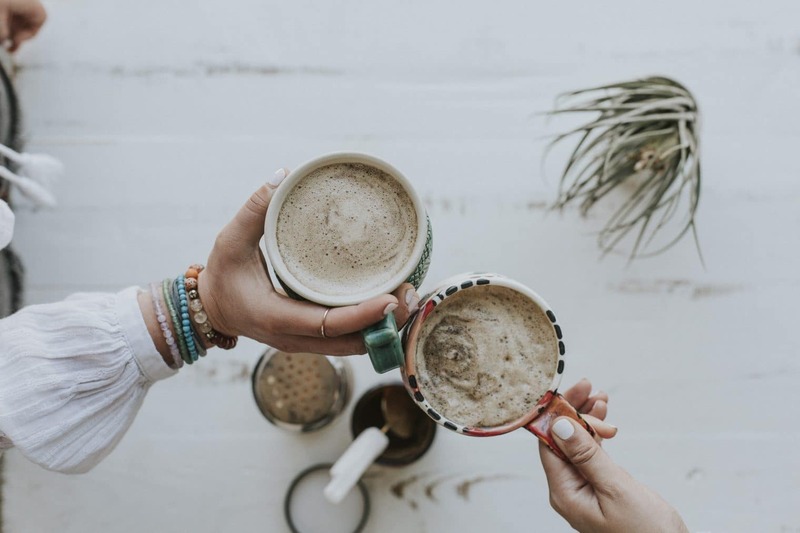 This post will answer all of your questions about mushroom coffee and my favorite mushroom coffee drink. It’s energizing, filling, and so delicious. Alright, you guys the time is here: let’s talk about MUSHROOM COFFEE!! I’ve been making this “mushroom mocha” drink and sharing it on my Instagram stories daily for a few months and I get SO. MANY. QUESTIONS. about it, so I decided to address them all in a blog post that you can reference whenever you’ve got questions. This is going to be a Q+A style post with all the questions I typically get about mushroom coffee and the recipe is at the bottom. I’ll share some different versions that I make – depends on my mood and what I have on hand. By the way, this post is not sponsored, but I am an affiliate for Thrive Market and Four Sigmatic. This means that if you decide to purchase through my links, I will make a commission at no cost to you. 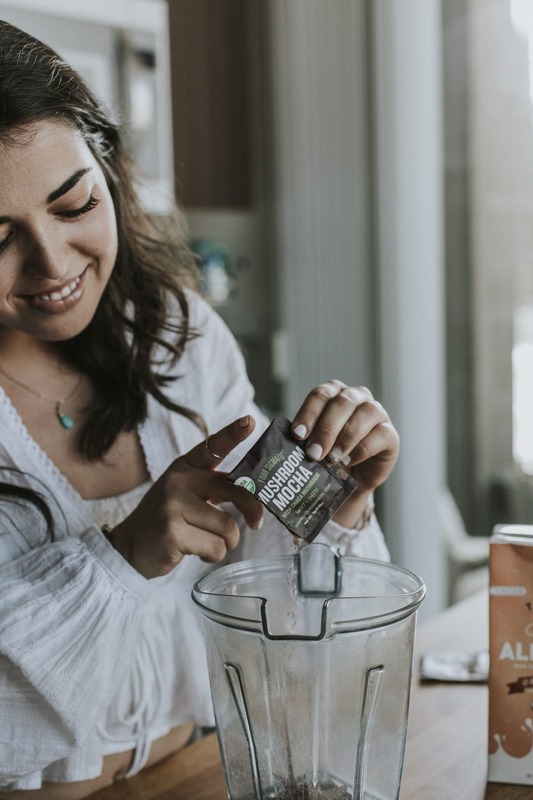 Using the code BAKERITA for Four Sigmatic will get you 10% off and you’ll get 25% off your first order by using my Thrive Market links (or go directly to ThriveMarket.com/Bakerita). What IS mushroom coffee? Does it taste like mushrooms? Mushroom coffee is, like it sounds, coffee that has mushrooms in it! No, they are not portobello or cremini mushrooms like you have on your dinner table, so the coffee does not taste like mushrooms. These are adaptogenic mushrooms, like reishi and chaga and lion’s mane. Each of these adaptogenic mushrooms has different benefits and supports our body’s functions in a different way. The mushroom coffee I use is from Four Sigmatic. My favorite blend is the Create Blend, which has both Lion’s Mane and Chaga. Lion’s Mane is said to improve memory and concentration, while Chaga is detoxifying and has tons of antioxidants and anti-inflammatory properties. This is the perfect blend for me when I’m having a work day and need to be focused and inspired. I also love the Achieve Blend, which uses the mushroom Cordyceps in addition to Chaga. Cordyceps supports energy, stamina, and athletic performance. It also has a ton of antioxidants, making it a perfect pre-workout or pre-hike blend. I have a hard time drinking regular coffee these days since I quit drinking it right after I graduated from college, which was over 3 years ago now. Whenever I would drink coffee, I would get incredibly jittery and anxious. When I tried mushroom coffee though, it balanced out all of the negative feelings of coffee and instead gave a boost of creative energy. 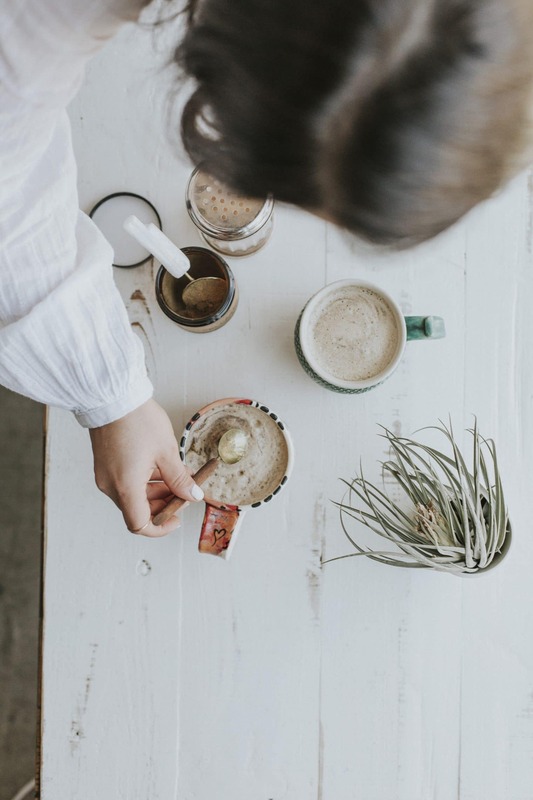 Also, I used to get major headaches if I skipped a day without coffee, but with mushroom coffee, I can skip a day without that unpleasant side effect – I do miss the taste when I skip a day, though! So, does it have caffeine in it? Yes, it does, but not as much as a traditional cup of coffee. The packets I use contain 50mg of caffeine, compared to the 95-200mg in a cup of regular coffee. Having less caffeine helps eliminates those jitters/anxiety that I mentioned earlier! What is the drink that you make every morning? It’s my Mushroom Coffee Mocha, AKA probably my favorite drink ever. I whipped it up one morning when I first tried mushroom coffee and have been hooked ever since. It keeps me full for a couple of hours and gives me tons of creative energy to get work done. Oh, and it is so, so delicious. I use a mix of half dairy-free milk/half water. To measure, I just fill the mug that I’m going to be using with the liquids. I’m usually using almond milk, oat milk, or a homemade nut or seed milk. 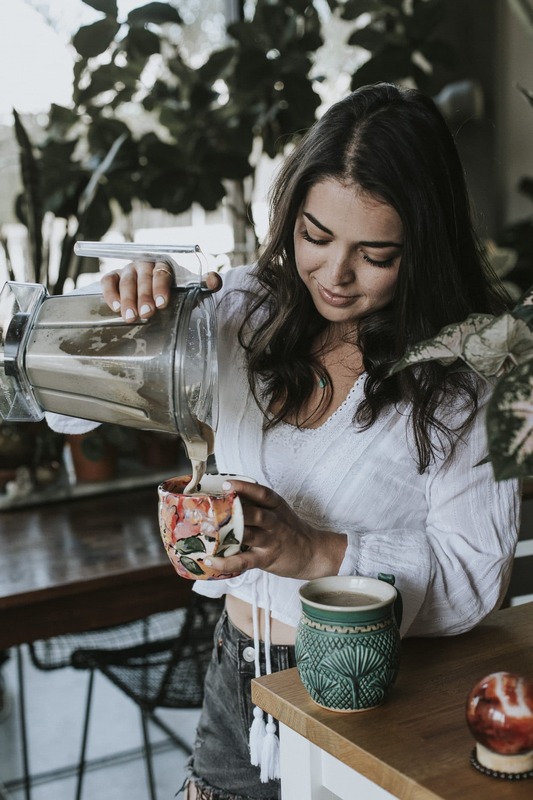 I heat that until steaming in the microwave and add it to my Vitamix with 1 packet of the mushroom coffee I’m using that day, 1 teaspoon cacao powder, a couple discs of Sunfood Cacao Butter, a couple shakes of cinnamon, 1 teaspoon plant-based collagen, and 1/2 teaspoon Manuka honey. Back up – what is plant-based collagen? How does that work? Since I’ve cut animal products out of my diet for the most part (obviously honey is an exception), I wanted to replace my animal collagen with a plant-based alternative and Anima Mundi came through. They have an herb-based collagen booster that helps stimulate collagen production in your body by boosting the body’s collagen receptors. 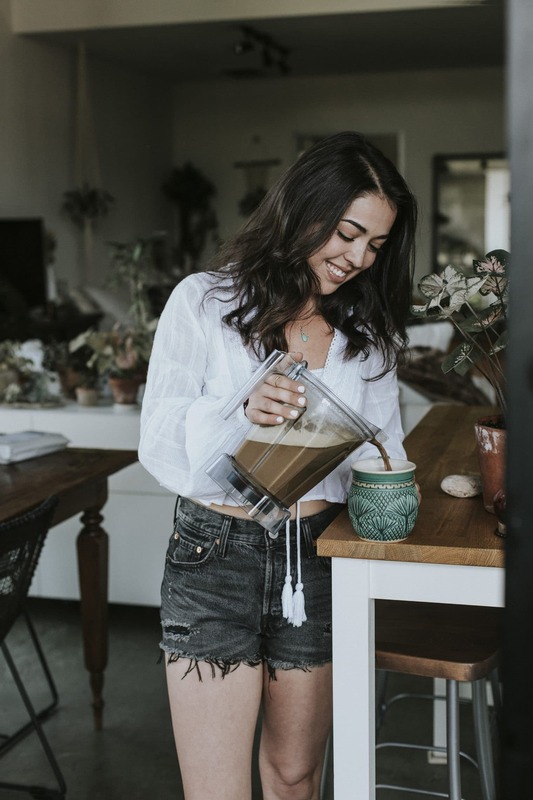 They have a wonderful post on their site all about plant-based collagen and how it works, so head over here to read that post. Where should I get everything??? I get the majority of the ingredients for my mushroom coffee from Thrive Market. Thrive has so many of my favorite pantry staples so I’m always ordering from there anyway. It’s easy enough to add all of my mushroom coffee goodies to the order. I’ve been mentioning them throughout the post, but I’ll link to all of the ingredients that I use here for easy reference. I occasionally add these other favorites, but I don’t use them every morning. I bet while you’re on Thrive ordering all these goodies, you’ll find so many more items you love too! They have so much great stuff to try, my orders always get a little bit out of hand and I end up with all the goods. Thank you to my wonderful friend Tiffany Le for taking these photos! 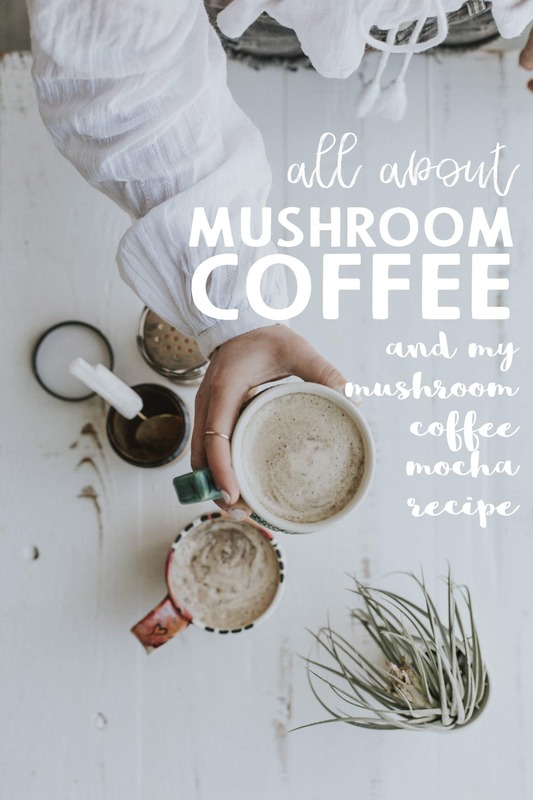 All About Mushroom Coffee + My Mushroom Coffee Mocha Recipe! 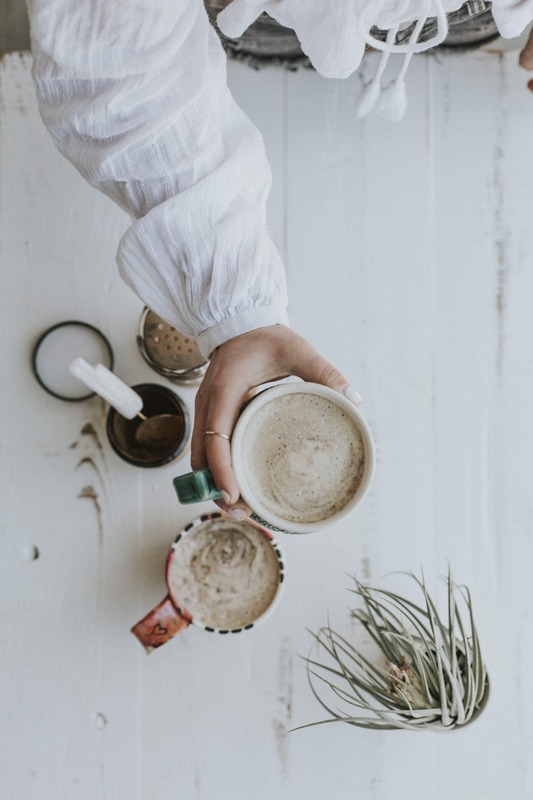 This post will answer all of your questions about my mushroom coffee drink. It's energizing, filling, and so delicious. Fill your cup halfway with dairy-free milk and then fill the rest of the way with water. Heat in the microwave for 1 minute 30 seconds to 2 minutes, or until it's steaming. 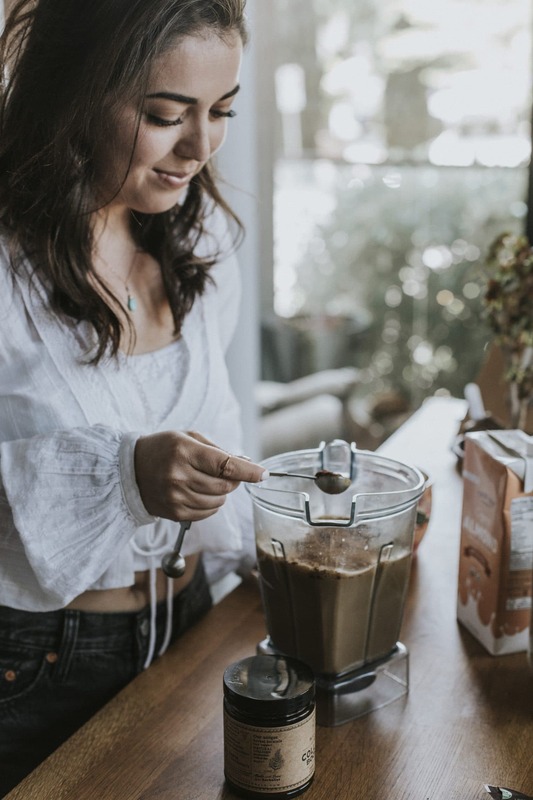 Add the hot liquid to the blender (I use my Vitamix) along with the mushroom coffee, cacao butter, cacao powder, plant-based collagen, Manuka honey, and cinnamon, if using. Blend on medium-low for about 1 minute, or until frothy and well blended. Pour back into your mug and serve immediately. Instead of the cacao powder and cacao butter, sometimes I will use 1 tablespoon of this Cacaco Drinking Chocolate for an extra chocolatey + rich drink. FOR THE PUMPKIN SPICE VERSION: skip the cacao powder, add 3/4 teaspoon pumpkin pie spice, 1-2 tablespoons of pure pumpkin puree (or better, pumpkin butter), and sweeten with maple syrup instead of honey. FOR THE GINGERBREAD VERSION: skip the cacao powder, add 1/2 teaspoon cinnamon, 1/4 teaspoon ground ginger, pinch of ground nutmeg, 1 tablespoon molasses, and sweeten with maple syrup instead of honey. I love this! Good news for coffee lover like me. Thank you for sharing! Have you found any mushroom mocha without stevia? I hate stevia. I tried the same brands mushroom hot cocoa and the stevia was too strong for me. Thank you! This sounds so good, need to get some cocoa butter. I hate stevia too!!! 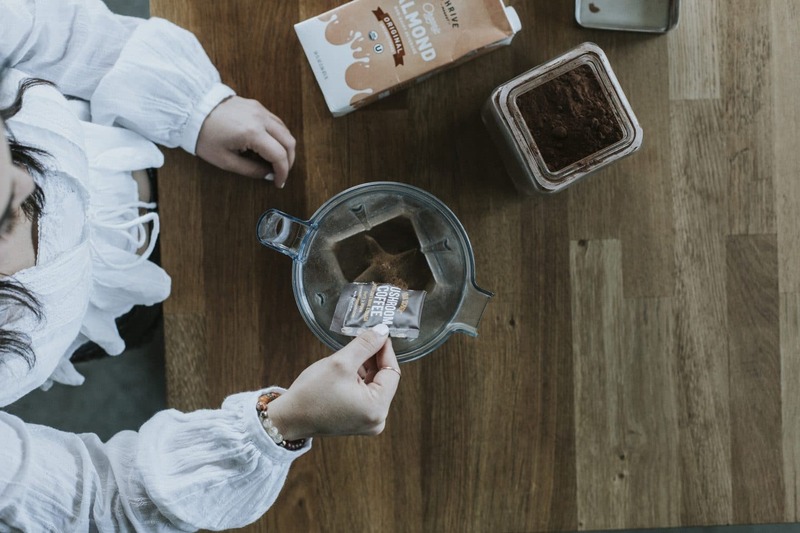 I use the regular mushroom coffee from Four Sigmatic, as mentioned in this post, not the Mushroom Mocha mix (which has stevia). The one I use is unsweetened! You can use a few coconut-sugar sweetened chocolate chips in place of the cocoa butter if you can’t find any. Wow! Thank you so much for this recipe. I had gotten mushroom coffee and wanted to give it a try after reading all the health benefits. I am usually a black coffee drinker and it took everything I had to finish my first cup of plain mushroom coffee! I struggled through and thought I had just wasted a bunch of money. However I came upon your recipe today and I am hooked! So smooth and wonderfully soothing! Thank you for sharing your recipe. You made my day. Hi Tonia, so happy to hear this helps you enjoy your mushroom coffee! This is my favorite way to drink it, and makes it taste like a delicious treat :) the health benefits are a major bonus! Thanks so much for your feedback, and enjoy the rest of your mushroom coffee!